With Pegs & Jokers, Players draw cards and race their pegs around the track. The first player to get their five pegs home wins the game. You can also play with teams. Pegs and Jokers is particularly popular with RVers. It is portable and stores neatly in a box. Pegs and Jokers is also known as Jokers and Pegs and the Social Security Game. It is similar to Parcheesi and Sorry, which were derived from the ancient Indian game of Pachisi. For ages 7 and up. 2 to 6 players. Full instructions are included in the box. 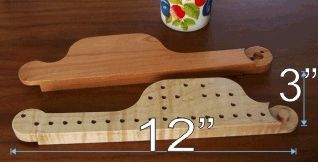 Our hardwood game paddles are 12" long and 3/4" thick, are made from three different hardwoods and are sealed and finished with urethane to last for generations! Includes everything needed to play the game. ♦ 36 wooden pegs of six vivid colors. ♦ 3 decks of playing cards. ♦ A velvet draw string bag to store the pegs. ♦ Six 12" solid hardwood game paddles made of 3 different hardwoods. ♦ Your game arrives in a reusable white cardboard box that can be used to store the game. Each hardwood game paddle is 12 inches long, 3/4" thick, and is hand finished with a durable urethane varnish. Most of the woods used are harvested here in Upstate New York from replenished forests. The 6 game paddles are made from three different hardwoods. 2 Cherry paddles, 2 Sapele (mahogany) paddles, and 2 Oak paddles. Or, check the Dark Wood option to get Sapele (mahogany) paddles only. The paddles loosely interlock with round mortise and tenon joints (see the photos). You can connect the paddles to make a 4 or 6 player game. If you are looking for our 8 player game, click here. You get 6 pegs for each game paddle: A total of 36 painted wooden pegs of six different colors. Possible colors are Green, Yellow, Blue, Black, White, Cool Gray, Pink and Red. Although only 30 pegs are needed to play a 6-player game (5 pegs per player), our unique design adds a stationary peg to each paddle. This allows each player to choose both a hardwood paddle and a peg color. Players can easily see each color's home position even when all of a player's pegs are in play. The individual game paddles connect with round mortise and tenon joints which allows a variety of layout possibilities to fit your table. The photos below show some of the layouts and their total size. * A 4 player game consumes 12 inches square. * A 6 player game consumes 20 inches square. Note that the photos shown on this page are of one of our Pegs and Jokers board games and are not necessarily photos of the exact item you will receive. We are so very pleased with our new 'pegs & jokers' game! The craftsmanship is outstanding. We look forward to many years of enjoyment! Surely our game will become a legacy to our child due to the high quality materials used. We will highly recommend your business to others. Thank you for this quality product! The craftsmanship of Mr. Strenz' game board is absolutely wonderful. The quality is excellent, and the different types of wood make it unique. It has a very smooth finish, nicely drilled holes and a sturdy feel. It is built to last. Our family loves this game! My parents taught my kids how to play, so there are 3 generations having tons of fun!